With the basic information in hand, the reader progresses to an account of the role of EEG in the diagnostic work up in psychiatry, covering nonconvulsive status epilepticus, frontal lobe seizures and non-epileptic seizures. The clinical application of EEG in both childhood and adult disorders follows, including many case vignettes. The effects of psychotropic drugs on EEG are highlighted. The material is clearly presented throughout, with plenty of figures, tables with summaries of relevant findings, flow diagrams for diagnostic work-up, boxes with learning points, and short lists of key references. 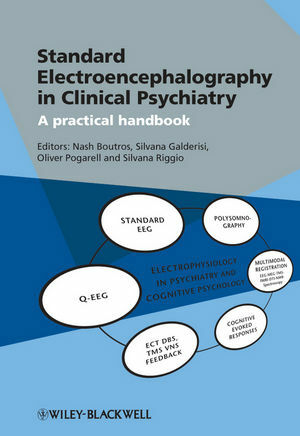 "This distinguished group of editors has put together chapters that represent an excellent practical handbook on electroencephalography in clinical psychiatry, now a very important topic. I highly recommend it not only to psychiatrists, but also to anyone interested in neuroscience." Nash Boutros, MD, is Professor of Psychiatry and Neurology, Director of the Divisions of Clinical Cognitive Neuroscience, Neuropsychiatry and Clinical Electrophysiology, and Associate Chair for Research of the Department of Psychiatry and Behavioral Neurosciences at Wayne State University School of Medicine. He is the local Director of an NIMH-funded multicenter study for the identification of the endophenotypes of schizophrenia and bipolar disorders. Dr. Boutros is internationally renowned for his research on the electrophysiological correlates of psychiatric disorders, particularly schizophrenia, the relationship of isolated epileptic activity to psychiatric disorders and the development of methodology to facilitate the translation of interesting biological findings to clinically useful tests. In recent years, his research has focused on developing an animal model for isolated epileptic spike discharges and examining the behavioral correlates of such events. This effort is motivated by the not uncommon human problem of having isolated epileptic discharges and behavioral aberrations in the absence of frank epilepsy. Dr. Boutros is a senior fellow of the American Psychiatric Association and fellow of the American Neuropsychiatric Association and one of the founders of the EEG and Clinical Neuroscience Society (ECNS). He is Editor-in-Chief of the International Psychiatry and Behavioral Neuroscience Year Book which selects papers published from all non-English languages where science is published. Dr. Boutros has written over 170 peer-reviewed journal articles and chapters, as well as The Brain and Behavior: An Introduction to Behavioral Neuroanatomy. Silvana Galderisi is Professor of Psychiatry and Director of the training school in Psychiatry at the University of Naples SUN. She is Director of the Emergency Unit of the Department of Mental Health of the same University. She is also Chairperson of the WPA Psychophysiology Section, President of the EEG & Clinical Neuroscience Society, co-Chair of the International Society for Brain Electromagnetic Topography. She has authored more than 150 publications, in national and international journals and books, and is member of the Editorial Board of Psychiatry Research Neuroimaging, European Journal of Psychiatry, Brain Topography, International Journal of Psychophysiology, Neuropsychobiology,Clinical EEG and Neuroscience and European Psychiatric Review. Her main contribution to the international literature in the field of Electrophysiology includes EEG and ERP abnormalities of major psychiatric disorders, especially schizophrenia, and the identification of early drug-induced EEG changes predictive of treatment response in schizophrenia patients. Oliver Pogarell MD, PhD, is neurologist, psychiatrist and Head of the Dept. of Clinical Neurophysiology and Functional Neuroimaging at the Clinic for Psychiatry and Psychotherapy, University of Munich, Germany. He is member of national and international neurophysiology societies and host of annual scientific training courses in clinical neurophysiology in Germany. His lab offers the entire spectrum of neurophysiological diagnostics for the Dept. of Psychiatry with about 3500 EEG recordings per year. In addition to visual EEGs within the clinical routine, he has expertise in quantitative EEG techniques including dipole source analysis or low resolution electromagnetic tomography both in resting state and under stimulation with cognitive paradigms. His research has focused on neurophysiology as well as functional and molecular neuroimaging in neuropsychiatric disorders. Silvana Riggio, MD, Professor of Neurology and Psychiatry at the Mount Sinai School of Medicine (MSSM). Dr.Riggio trained in Neurology at Georgetown University. She is fellowship trained in neuro-electrophysiology at John Hopkins and in Clinical Epilepsy at the Medical College of Pennsylvania (MCP). She served as the Co-Director of the Mid- Epilepsy Center from 1989 – 1991 and the Director of the Epilepsy Program at Mayo Clinic Jacksonville, 1992-1995. Dr. Riggio developed a strong interest in disorders of the frontal lobe and their behavioral manifestations. She trained in Psychiatry at Cornell Weill Medical Center after which she came to Mount Sinai in 1998. She has lectured nationally and internationally and has participated on National Committees related to traumatic brain injury (TBI). Dr. Riggio participated on the ACEP-CDC guidelines task force on mild TBI which was published in December 2008 and is currently finishing a CDC project on discharge instructions for patients with mild TBI. Dr. Riggio has expertise in understanding the interface between neurologic, behavioral, and physical health. She has authored over 50 articles and book chapters and has edited 8 books and journal supplements. Most recently she edited a theme issue of the Mount Sinai Journal of Medicine, "Traumatic Brain Injury, from Bench to Bedside to Home". She is currently editing an issue for the Psychiatric Clinics of North America on Traumatic Brain Injury. Dr. Riggio is a member of the advisory board for the Indian Head Injury Foundation and also for the Foundation for Education and Research in Neurologic Emergencies (FERNE).She has been the primary investigator or co-investigator on 22 grants. She has been recognized for excellence in teaching having received many awards including the MSSM Institute of Medical Education Teaching Achievement Award; she was honored the title of Commendatore OSSI by the Italian government in 2009. Dr. Riggio is the Medical Director for the NFL Neurological Care Program at Mount Sinai which was established in 2010. 6 The Role of EEG in the Diagnostic Work Up in Psychiatry: Nonconvulsive Status Epilepticus, Frontal Lobe Seizures, Non-Epileptic Seizures (Silvana Riggio). The role of EEG assessment of drug-induced CNS toxicity in psychiatric patients.